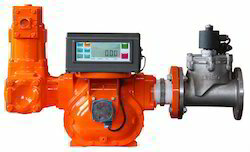 We are the Leading Manufacturer of Positive Displacement Flow Meter, Turbine Type Flow Meter, Paddle Wheel Flow Meter and various type indicator. Flame proof indicator used in hazards area. Fuel Level sensor, Ultrasonic level sensor and online monitoring of various parameters like Fuel consumption and Fuel Level monitoring systems to various industrial sectors. 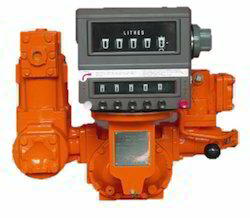 Positive Displacement Flow Meter (PD Flowmeter) is a system with freely-moving blades used to measure petroleum products such as fuels, bio-fuels and refined liquid hydrocarbons. Its simple design with only two pairs of blades and one moving rotor makes it exceptionally robust and allows the user to make significant savings on maintenance costs. The product enters the measuring chamber following the direction of the arrow. The rotor and blades assembly (1-2) is set in motion by the pressure of the liquid on blades. A certain amount of liquid (3) is held between 2 blades and then directed to the discharge manifold. The volume of liquid measured at each rotation is therefore equal to 4 times the measured quantity (3). The smooth curves the meter pieces provide a steady, non-fluctuating flow resulting in low head loss. Line Size 1" to 6"
Bulk meters are precision made, positive displacement, liquid measuring instruments, which maintain accurate metering over long periods of operation. The simplicity of design and construction together with sustained accuracy of an bulk meter has led to the widespread use of these meters on aviation refueling vehicles, in oil terminals throughout the world and also as master meters for use in calibration. Not effected by outside factors caused by the installation. Accuracy consistent between calibration levels. Suitable for use in distribution depots and aviation refueling vehicles. Serviceability: designed for quick and easy maintenance. We are looking inquiries majorly from Tamil Nadu, Kerala, Karnataka, Andhra Pradesh, Telangana, Pondicherry. Positive Displacement (PD) Flow meters are volumetric flow measurement instruments that measure flow by passing a precise volume of fluid with each revolution. PD flow meters are precision instruments whose internal moving components are hydraulically locked in tandem with the volume of fluid moving through the flow meter. 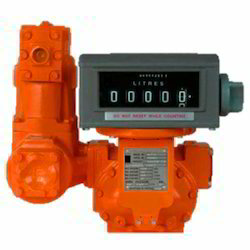 The result is that the meter can measure intermittent flows, very low flow rates, and liquids of almost any viscosity. The PD meter instantly moves when there is fluid motion, and instantly stops when the fluid motion stops. Bulk Flow Metering system is designed for road and railcar tanker loading stations with top or bottom loading configuration. The compact horizontal measuring unit is ideal for easy installation in smaller facilities. Tanker loading and unloading of any types of liquids. 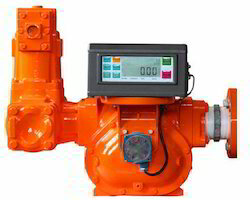 Positive displacement flowmeter technology is the only flow measurement technology that directly measures the volume of the fluid passing through the flowmeter. Positive displacement flowmeters measure the volumetric flow of fluids in pipes, such as water, hydrocarbons, cryogenic liquids, and chemicals. The industries where they are used in descending order are oil and gas, water and wastewater, chemical, power, pharmaceutical, food and beverage, pulp and paper, metals and mining and aerospace.